“an excellent introduction to a fun and challenging activity." With the snow melting and the temperatures rising, one’s thoughts turn to getting outside again. Running, cycling, all sports present opportunities to get the exercise juices flowing. Nordic walking, however, is probably not on the agenda. More the pity because this is aerobic exercise on steroids. This new book gives you an easy to read overview of the sport and step-by-step instructions on how to achieve the best results. Many believe that Nordic walking was originally developed as a summer exercise for cross-country skiers in Finland. Over the years the techniques have been developed to provide an effective outdoor activity—even for those who hate the snow. The book is written with a U.K. audience in mind, but that does not detract from its overall effectiveness. It does mean there are phrases, references, and spelling that are more British than American but understandable nonetheless. Unlike walking or running, Nordic walking does require equipment. In this, the author scores big. He takes the time to describe the different types of poles and their components. Straps, shafts, and tips are essential parts of the poles. Stewart’s explanation gives enough information so even the most inexperienced person will feel comfortable selecting the right pole. The book also provides considerable information, recommendations, and opinions on the relative merits of various types of poles. Stewart has arranged the book so it deals with a topic in full before moving on. This is helpful if the reader is new to the activity and just starting to consider its possibilities. The chapter on what to wear boils down to: wear comfortable clothes, comfortable shoes, and dress for the weather. The chapters on what to take, warming up, and cooling down do not provide any earthshattering suggestions. Most of it is commonsense advice that is readily available from many different sources. Stewart has arranged the book to address the needs of the beginner as well as experienced Nordic walkers. 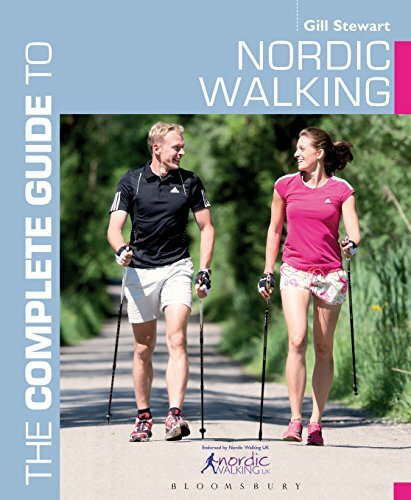 As the book progresses, he addresses ways to increase the challenge in a Nordic walking workout. He provides practice drills that up the ante and work to produce greater results. While Nordic walking is not as popular in the U.S. as it is elsewhere in the world, getting involved in the sport is not difficult. Gill Stewart’s book is an excellent introduction to a fun and challenging activity. Nordic walking is one of those sports that can be as tame or wild as you want to make it. Stewart references the NWUK—the Nordic Walking United Kingdom throughout the book. This will be of little interest to U.S. readers; however, the American Nordic Walking Association (ANWA) provides information about equipment availability in the U.S. as well as a schedule of instruction classes held around the country. Nordic walking is an activity that people of all ages and abilities can do, and the long-term benefits are worth the effort.